Satisfied customers don’t always remember to write reviews, so it’s important to give them a reminder after they make a purchase or interact with your business – but remember to keep review guidelines in mind. Try including a survey link in your receipts or sending an automated follow-up email, rather than, say, setting up a laptop for reviews in-store, or offering incentives, which violates Google policy. It’s important to address both positive and negative reviews, since 83% of customers remember reviews from search results.2 When responding to reviews, it’s always good to thank customers. In the case of a negative review, address the issue without getting defensive. For example, try posting a reply describing the steps you took to remedy the situation. These personalized responses are an opportunity to build relationships with customers. Don’t be afraid to highlight your business’s personality. Managing reviews is an ongoing process, so you should make sure to check in periodically and stay up-to-date with what your customers are saying. 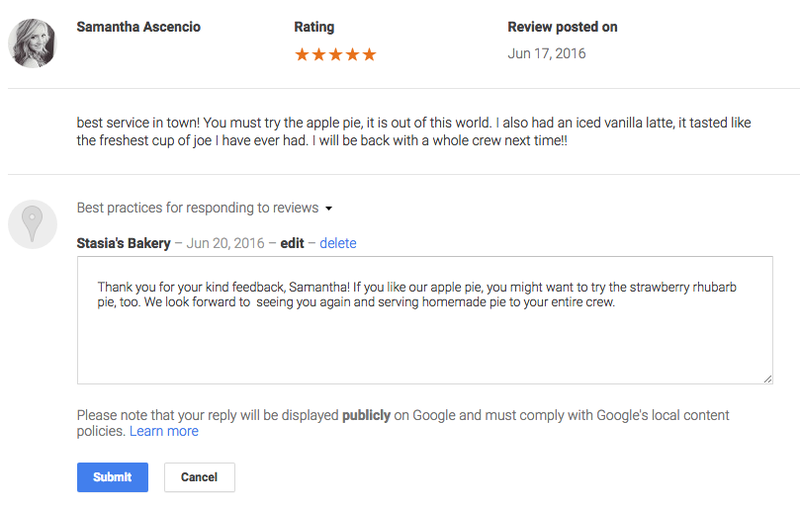 You can do this by checking the reviews section of your Google My Business dashboard. Your back-to-school assignment? Apply these lessons to your business, and start getting proactive about online reviews. 2. Google/ Ipsos, Impact of Search Listings for Local Businesses. Base: Saw Listing (Control=494, Test= 496), August 2014.